Affiliate Marketing is the best way to make money if you learn to promote affiliate products? Today I am going to discuss with you on how to Promote Affiliate Products because in the last article we have discussed the common mistakes did my many newbie affiliate marketers. Ok fine, you have learned the mistakes and not making any in your career, but now you should know how to market a product through your blog (or) without a blog. As you know, Affiliate Marketing is a business model who can earn money by promoting other merchant’s product (or) services on behalf of them. They will be paid a commission on every successful sale (or) lead. It is a great way to make money online from the internet and you can easily become rich when you put true efforts and smart work. Even, I have started my career as an Affiliate Marketer after completing my college studies and now making a decent monthly income. Ok fine, now let’s get into the discussion of various strategies to be worked out to promote affiliate products to get huge sales and commission. These ideas will gonna refresh you surely and give you some working plans that can be implemented immediately. This is the first step when you prepare yourself to start an Affiliate Marketing Business, as blogging plays the most important role. Today many people were starting a blog for making money as there are different methods to monetize a blog. Among the various monetization methods, Affiliate Marketing is one of the most successful programs to make money from a blog. Whenever do you ask for the most successful affiliate marketers about their success? Most answers were, “Starting a blog”. This is the finest way to travel safely in your career because your one-time work will yield revenue for the long term. Even though you can make money with affiliate marketing without a blog, but this will give success only to those people who have created their brand. EasyOnlineHomeJobs, helps you create your own affiliate marketing blog if you think starting this business will be a successful one. Once you have decided to start a blog, you cannot do it right away without any plan. Yes, because you have to perform thorough research about the market and find the blogging niche to start. In the next section, I have written the important steps in starting a blog which is suitable for affiliate marketing. i.) Find the right niche: There should be a sole purpose to start and run a blog. You should do research and identify the right niche to start blogging. ii.) Understand your audiences: This is another great task to be done before starting a blog. You should know who are your audiences and where are they located? iii.) Finding the right program: There are many different kinds of programs are available in affiliate marketing such as pay per lead, pay per click, pay per sale etc. Choose the right one wisely. iv.) Choosing the products: After selecting the program, you should now search for the products that are trending and most demanding in the market to become successful. v.) Installing Affiliate tracking code: Register an account and get your unique tracking affiliate URL to paste in your blog to bring visitors to the sale page. vi.) Promoting blog to drive traffic: After you have created your blog, you have to perform SEO activities to rank your blog and bring traffic to your affiliate URLs. Learn further in this article, how to choose the right product for your Affiliate Marketing Business? 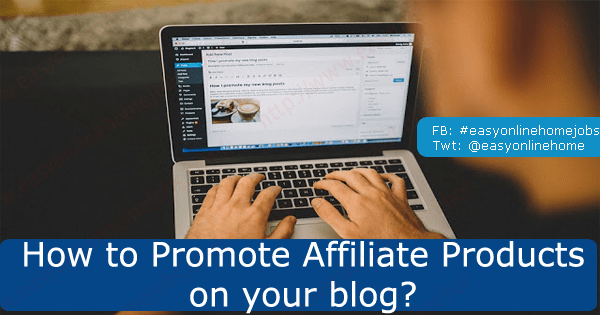 Now let us discuss the various tips on how to promote affiliate products on your blog effectively to bring in more sales thus more revenue. When you found the right product for your affiliate marketing promotion, it’s time to know the different promotional strategies of the affiliate products. You can easily become an affiliate for any program but to become a successful affiliate marketer, you should have some special skills that you gain from experience and experiments. There are lots of ways to promote affiliate products and further we will discuss this in detail. It’s the best way to promote affiliate products. When a visitor intends to buy a product (or) service, they do search for the same on Google. Then Google recommends your blog and visitors start visiting your blog to learn about the stuff you have for them. Also, they won’t buy the product (or) services at their first visit on your blog page. They will do a lot of research about the product they are willing to buy. Everyone wants to buy a genuine product and they will decide it after long research about the product. As an Affiliate Marketer, you should understand this mentality and hence I am recommending you to write a review post about the product or service. Review writing is the best solution to tackle this trend and surely helps you to improve your conversion ratio as wel. 2.) How to Write a Review Article? So in the above section, I asked you to write a review post, but this is the next question absolutely you have in your mind. How to write a good review article that easily convinces your visitors to buy the product or service you have recommended. This is easy when you understood how? First, it gives a brief introduction to the product (or) service and the merchant. Second, explain the working of the product. Then, share your own experience or your friends experience with the product. Do not write about the product or service which you haven’t tried on your own or by your friends. It will give you a negative impression in front of your visitors and they will never come back to visit your blog. An honest review of the usage of the product will get more conversion than just a product advertising review. 3.) What to Write to Promote Affiliate Products? Article writing is an art. A Quality content is the king. How to write an evergreen article that brings you traffic for a very long time and thus gets you repeating conversions for your affiliate products? You are going to write an article about a WordPress theme that is best suitable for Affiliate Programs. In this post, you should be mentioned the required tools, that is, WordPress Theme. Use the affiliate link of the theme (affiliate programs) from the WordPress Theme Seller with whom you are associated with. Write a detailed review about the purpose of the theme, how to install and setup? and how to optimize to start the business? This way your reader can be taken to your affiliate landing page where they can come to buy the theme you recommend. Do not recommend only one seller, because some people can’t afford their cost. If you promote only one seller, it silently meant that it’s just an Affiliate Product Review post. But the main karma is Best Affiliate Marketing WordPress Themes. EasyOnlineHomeJobs, uses Thrive Themes, a truly conversion optimized word press themes to get more leads and sales. Their price starts from $67 for a single site. Purchase a theme and then start your first affiliate marketing blog with THRIVE. Every WordPress blog has different sections such as Header, Navigation, Article-container, Sidebar, and footer. You can leverage this different section of the every page to promote affiliate products virally. You can use banner ads, text link ads of an affiliate product and paste in your sidebar widgets can increase your chances of conversions. You can create an image of your own and customize your sidebar with appealing images also increases sales. Use other sections such as Header, footer and place a banner ad. Make sure the products you promote are related to your blog/website and also promote one best product that you (or) your friends tried. These types of posts also can help you bring more conversions for your affiliate marketing campaign. There are many deals such as Seasonal sale, Black Friday Deals, Cyber Monday Deals, Amazon’s Great Indian sales etc. Normally, several affiliate programs have a wide range of offers and deals during these periods. You can make use of these and write comparison posts of different products and end with the best price chart. This helps your visitor’s to get themselves to come up with a decision to buy the best products at cheaper prices. The best example to promote such products are Hosting Deals, Apparels, SmartPhone’s, Laptops, Computers etc. are a great source to promote affiliate products. A recent report from Google indicates that most searches from the world are circling around finding a solution for some queries. How to choose the right Affiliate Product for marketing? These types of articles can easily get more traffic and proportionately improve your conversions. Also, you can write a post whenever you figured out something that you really did well. Share it with your readers with your affiliate links and this may help you out to get more sales. DIY (Do-It-Yourself) (or) Tutorial types of the post also do good to promote affiliate products. For example, EasyOnlineHomeJobs uses Thrive FocusBlog Theme to power this blog. So, the article about How to use FocusBlog Theme for your Affiliate Marketing Blog? type of post can encourage users to buy the theme because the posts answer all their queries. In this type of article, let’s take the same example, “WordPress Hosting”. There are several hosting companies in the market and some of them are GoDaddy, BlueHost, Kinsta, Hostgator are the major hosting resellers. So, you can write a post on the title, “Best Hosting Providers“, to let your visitors choose the best hosting services for their blog needs. This will save them time and also you will get more conversions because as said earlier in this article, people use to compare products before making any purchase decision. Write “Where To” type of posts in your blog about the product. You can create a static page on your blog that lists all the affiliate links of your blogging tools like WordPress Themes, Plugins, SEO Tools etc. This helps your blog audience to buy the same because they are watching you for a long time of your blogging. This thing itself drive them to purchase the list of tools you have. Also, if there are any coupons available for the products, of course, you can add it. At the end of the blog post, create a large button leading to your affiliate lead page. This ensures your blog reader’s attention thus giving you some sales. You can either promote the product you have mentioned in the article (or) offer a complimentary product to take them further. It’s an important to-do action to become a successful affiliate marketer. Collecting your visitor’s email id’s through subscription form is a great way of communicating with your blog audiences. You can send them an offer email (or) periodic newsletters about the deals and new product launch etc. This helps you stay in touch with your blog audience and develop a bond between you and them. When you created a strong bond between both of you, your future sales can be pretty easier. Your primary goal is to convert every visitors of your blog into a buyer (or) returning customer, which is the secret of the success in the affiliate marketing business. Understanding audiences and write posts let them make their own decision will be the first intention of your affiliate content. When you are able to provide them a solution, surely you can bring a sale. Learn it, work it and all the best. So far, I have shared my findings on different strategies to promote affiliate products on your blog. I think this will help you in getting new ideas on your next blog post. No one is an expert at the beginning of a new business, but they become an expert by learning and experimenting. Help me through commenting your suggestions, feedback about this article below as this will create a better understanding and help creating new ideas on Affiliate Marketing.